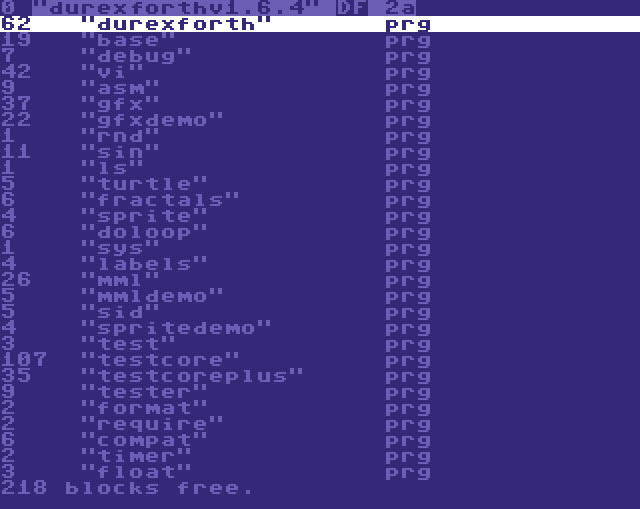 DurexForth is a half-minimalist C64 Forth inspired by colorForth, JONESFORTH and Blazin' Forth. PDF manual is included inside the archive. Durex Forth v1.33 with PDF manual included. forth: added u. unloop leave cell+ cells page key? forth: renamed char to getc, and added a new char that works according to the Forth 2012 standard. Various bug fixes for evaluate/vi f7. forth: now available as a 16 kB cartridge image. the cartridge has the same functionality as the disk version, but boots faster. editor: :w on unnamed buffer now prints "no filename"